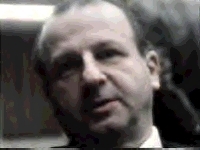 On March 18, 1965, Jack Ruby's attorneys made an appearance in the United States District Court in Dallas, with Judge T. Whitfield Davidson presiding, seeking a writ of habeas corpus in order to insure that control of Ruby's whereabouts remain under the jurisdiction of the Federal Court and the Federal Marshall. Opposing arguments were also heard from the State, represented by Bill Alexander. The following afternoon Judge Davidson called a further hearing on the matter, As required by law, Ruby himself was brought before the judge, but none of Ruby's attorneys were prepared to attend. Ruby took advantage of the opportunity to speak without his attorneys present, interrupting the proceedings to make an unexpected appeal to the judge. "Your Honor, may I say something? I don't have any counsel here, your Honor, and I wish the courtesy of the Court to give me a chance to take the stand . . ."
Attorney Joe Tonahill was on hand, and, although he was not formally representing Ruby at the time, was allowed to preface Ruby's statements with some remarks. Tonahill sought to inform the Court that psychiatrist L. J. West had sworn an affidavit stating that "Jack Ruby was insane, and highly susceptible to delusions and suspicions, and a complete paranoid." Dr. West had demonstrated, Tonahill said, that Ruby's condition necessitated the presence of an attorney to represent him. He also insisted that Ruby's mental illness was primarily responsible for his own removal from Ruby's defense team. Judge Davidson allowed Ruby to speak, however. "I will permit him to stand where he is," without requiring Ruby to be sworn in, "and he may give the Court any statement he may care to give." Ruby wasted no time whatsoever. "This is the most tragic thing in the history of the world," he announced. "One of the most tragic conspiracies in the world," he declared. "I will get on the stand and speak with tears in my heart because of such a terrible conspiracy which is combined against me." This is it, ladies and gentlemen: the moment we've all been waiting for. Jack Ruby is about to blow the lid off one of the most heinous conspiracies of all time. What Mr. Tonahill has said is a total lie [Ruby continued]. That goes from the contract I signed, I never did sign a contract with him. It has been a conspiracy between him and the District Attorney, [attorney] Phil Burleson and Joe Tonahill, to convince the public that Jack Ruby is insane. Now, your Honor, you have had many a person appear before you pleading their case. If I am a person who sounds insane at this time, then the rest of the world is crazy. I say this with choking in my heart and tears in my eyes. The most tragic thing happened that Sunday morning when I went down that ramp. I happened to be there for a purpose which is going to be the most tragic thing that ever happened in this world. . . . [Lengthy description of Ruby's succession of attorneys omitted.] At 10:15, I left my apartment, and the story was out that this person [Oswald] was supposed to leave the jail at ten AM. I received a call from a young girl [Karen Carlin, one of Ruby's strippers] who wanted some money. [Because Ruby had closed his club for the weekend, out of respect for the slain President, Carlin was unable to pay her rent. ](1) I went to the Western Union, which was coincidental, and prior to that, I will admit [I'd read] a letter [that] was written to Caroline [Kennedy -- actually an editorial in the November 24, 1963, edition of the Dallas Times Herald] which broke my heart. This letter was written to Caroline telling her how awfully sorry I [sic] was for her. And another situation [in another article], there was something about a trial [Mrs. Kennedy expected to return to Dallas for Oswald's trial]. Don't ask me what took place, and that triggered me off that Sunday morning. I accepted the call at 10:15 and went down to the Western Union and parked my car across the street, and took off to transact my business. . . . At 11:17 I walked, I don't say it was premeditated, but never prior to Sunday morning, I never made up my mind what to do. From 11:17 until later, I was guilty of a homicide. Which must be the most perfect conspiracy in the history of the world that a man was going to accept a call and came from his apartment down to the Western Union. If it had been three seconds later I would have missed this particular person [Oswald]. I guess God was against me. I left the Western Union and it took about three and a half minutes to go to the bottom of the ramp. I didn't conspire or sneak in to do these things, I am telling you. If they had said, 'Jack, are you going down now?' that would make some conspiracy on me. I left the Western Union and it was a fraction of a second until that tragic act happened. Now, it seems all these circumstances were against me. I had a great emotional feeling for our beloved President and Mrs. Kennedy, or I never would have been involved in this tragic crime, that was completely reverse from what my emotional feeling was. Ruby returned to the subject of his numerous attorneys and how he felt they had mistreated him and mishandled his defense. As far as Joe Tonahill is concerned, he doesn't care what happens to me, nor does Phil Burleson, and I am not saying this just to make the headlines, I am not remembering this from rehearsal, I am speaking word-for-word, that I know what took place. And I am like the stupid idiot, that loved this country so much, and I felt so sorry for Mrs. Kennedy when she was standing on that plane with blood on her dress, and they were bringing the casket back with our beloved President, and now I am going to [go] down in history as the most despicable person that ever lived. If I am able to use this little oratory on you, as I am doing, if I have that capability, looking at you and telling this courtroom a slight fraction of a lie then I am a genius. Contrary to what some people would like to believe, whenever Ruby had a chance to describe the "conspiracy" against him, the "conspiracy" ultimately turned out to be a plot to falsely implicate him in the Kennedy assassination -- not exactly what conspiracy theorists would seem to have in mind. He also told the Commission that his actions had led to widespread anti-Semitic action, including the torture of Jews in the very same building in which the Warren Commission was deposing him. Such delusions would haunt him the rest of his life, and fired his guilt about his actions on the morning of November 24, 1963. Soon, however, he would come to believe that people higher up, including LBJ himself, were part of this anti-Semitic plot. Even on his deathbed, Ruby continued to say the same thing he'd been saying all along: that he was not part of any plot, and his close proximity to Oswald in the basement of Dallas police headquarters was a one-in-a-million coincidence. 1. Waren Commission Report, pp. 348-56. 2. Elmer Gertz, Moment of Madness: The People vs. Jack Ruby (Chicago: Follett Publishing Co., 1968), pp. 174-189. 3. Warren Commission Hearings Vol. V, p. 209. 4. Warren Commission Hearings Vol. V, p. 211.